Conservative Judaism and the Conservative Movement"
A Note from Rabbi Creditor: "To Israel"
This Monday morning, Jeff Rosenbloom and I will step onto the tarmac of Ben Gurion Airport outside Tel Aviv. We are representing Netivot Shalom on a 4-day mission of the Masorti Foundation for Conservative Judaism in Israel. We are honored to participate in this journey, during which we will visit almost every Conservative/Masorti community in Israel. From Kibbutz Hannaton, where Netivot Shalom member Michal Hirshfield moved last Summer, to Moshav Agur, where there is a Winery considering adopting a Kosher certification through the Masorti Movement, to meeting with Minister of Knesset Tzippy Livni - this is going to be a rush of important encounters. When we return one week from Sunday, we will likely be tired and inspired. 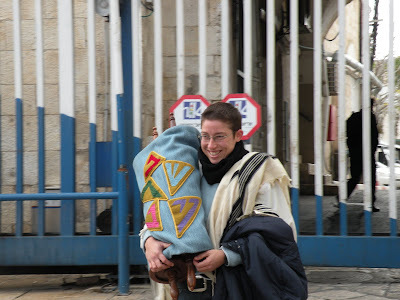 Though the incident involving Nofrat Frenkel, the woman who was detained by Israeli police for the "crime" of wearing a Tallit in the women's section of the Kotel, only occurred after Jeff and I had already committed to joining this mission, it fueled our commitment to sharing the strength of Netivot Shalom, a passionate, egalitarian, Conservative, participatory shul with our sister Masorti communities in Israel. This isn't tourist visit, not a Jerusalem-focused trip with excursions. It is an intense sustained encounter, aimed at raising North American awareness about the Masorti communities who continue to struggle for equality in Israel. When we speak of Israel, here in Berkeley, there is a constant fear of saying something you feel and receiving at best a withering look. But that's not the reality here at Netivot Shalom. We're proud to be in relationship with Israel, dream of and work toward more deeply just and free societies for Israelis and Palestinians just as we do for Americans and Iranians. There is, of course, real tension, but remaining silent when we can make a positive difference is not an option. But the way to get there requires attention too. 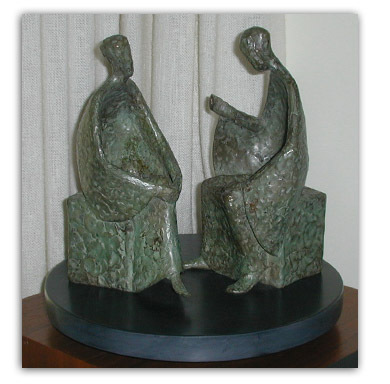 Respectful listening (shmi'at ha'ozen) is definitional for a diverse community such as ours here at Netivot Shalom. Israel is a core component of our family, and we therefore have strong opinions which belong shared with love and respect. The work of V'Zot Yisrael, Netivot Shalom's Israel awareness group, demonstrates our commitments to this very aspiration. 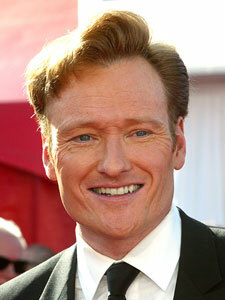 And, to learn another unacceptable response to tension through an unrelated recent public moment: comedian Conan O'Brien, the now-former host of The Tonight Show, closed his tenure as host by saying "Please do not be cynical. I hate cynicism. It's my least-favorite quality and it doesn't lead anywhere. Nobody in life gets exactly what they thought they were going to get. But if you work really hard and you're kind, amazing things will happen. As proof, let's make an amazing thing happen right now." Then he picked up his guitar and made some passionate, intense music with a group of friends. Nothing less should be our goal in relationship and kindness and love with Israel. If we can steal a moment from the trip's grueling pace, Jeff and I will try to share some short observations while still there. If we can't find those moments during the trip, we will certainly come home (from our other home) with much to share. Additionally, if you'd like to follow short reports I'll be sending out to my "Tisch" email list via PDA, you can sign up by sending a blank email to thetisch-subscribe@yahoogroups.com. With wishes for a week of peace and music in Israel and everywhere else, full of amazing things we've helped make happen through our life as a vibrant, dream-worthy community. Shabbat Shalom and Tu Bishvat Sameach! Of course, Sommers can't be faulted for the arguably excessive and potentially misleading pessimism of some of the interviewees. However, he does sometimes join in on partitioning the space of reasonable views in an overly restrictive way. For example, in his introduction to his conversation with Ruse, Sommers seems to characterizes the two main positions here as either realist and anti-scientific or anti-realist and empirically-informed (pp. 85-6). Surely any empirically-informed view must admit that morality is intimately bound up with our own concerns and natures. But the idea that our natural, evolved mechanisms for moral judgment and behavior are doing something more like detection than capricious fabrication could be given some more consideration. Welcome to the first e-newsletter from the Hannaton Educational and Spiritual Center. We have been busy during the past few months hosting groups, making light renovations, and planning for exciting upcoming retreats and future programming. We look forward to continue updating you on such activities. 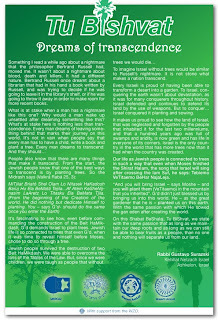 Our vision is that the Hannaton Educational and Spiritual Center will be recognized and respected as a meaningful and essential link the in the chain of Jewish revival and survival through its efforts in strengthening the Jewish, Israeli, and Zionist identities as individuals, as a society, and as a people. Wishing you a Happy Tu B'Shvat from the Galilee! Pre-Pesach Spiritual Retreat in April, 2010. Contact the center for detailed information. Groups We Hosted this Past Month! Masorti Olami (Students from Beit Hillel, a Masorti congregation from Buenos Aires, Argentina). HAZAK (The United Synagogue of Conservative Judaism's organization for people 55 years and older). The ONLY mikveh in the State of Israel not under the auspices of the Orthodox rabbinate is located on Kibbutz Hannaton. 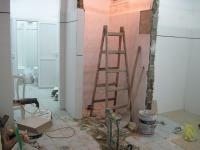 Light renovations are being made at the mikveh, including demolishing some walls in order to expand the building for educational programming. The dream is to turn this building into a pluralistic Life Cycle Center for all Israelis and visiting Diaspora Jews. 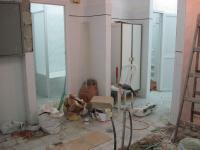 Much more work needs to be done and we are looking for your support. (Please, e-mail Shira Taylor Gura, Resource Development coordinator, for more information). A number of articles have recently been published about Kibbutz Hannaton. * Ben Harris, of JTA, recently visited Hannaton and wrote in his blog about the revitalization of the kibbutz. * Rabbi Haviva Ner-David is writing a monthly column in the Jerusalem Post about her move to Kibbutz Hannaton. * NPR recently wrote an article about the revitilization of kibbutzim in Israel, including Hannaton. for the Hannaton Educational Center! OR, for secure website donations, please, click here. Designate "The Hannaton Educational Center" in the "kehilot designation" field. We thank you for helping us continue our important work! [Shefa] Announcing ShefaJournal 5770:1 - "HaNefesh v'HaGuf: The Relationship Between Conservative Judaism and the Conservative Movement"
"HaNefesh v'HaGuf: The Relationship Between Conservative Judaism and the Conservative Movement"
This, the newest ShefaJournal, focuses on both the current states of Conservative Judaism and the Conservative Movement as well as their relationship past, present and future. It includes an edited version of the discussion inspired by Rabbi Menachem Creditor's Shmirat HaGuf: Caring for the Body of Conservative Judaism which took place between November 4 and November 16, 2009 as well as views on the relationship between ideology and institutions, inspired by related ideas developed in previous ShefaJournals. Forward.com: "Embassy Letter on Kotel Rubs Salt in the Wound"
An Israeli embassy effort to address the concerns of non-Orthodox Jewish leaders regarding the treatment of some worshippers at Jerusalem's Western Wall has instead inflamed many of them. The embassy's response — to a letter-writing campaign by Conservative Jews and others protesting the treatment of female worshippers who don't abide by the strictures of the Orthodox authorities controlling the site — stressed the need for compromise at the Western Wall. In the December 21 letter e-mailed to many who wrote, the embassy's office of public affairs cited the existence of Robinson's Arch, an alternative prayer site designated for egalitarian prayer in an archaeological park adjacent to the Western Wall Plaza. But David Lissy, executive director and CEO of the Masorti Foundation for Conservative Judaism in Israel, reflected the views of many who were contacted, dismissing the communiqué as "largely a non-response." "It doesn't deal head-on with any of the critical issues which need to be addressed," he said. "I think the government of Israel is failing to appreciate the degree to which the majority of Jews around the world care about these kinds of things." Conservative Jewish leaders called for the letter-writing campaign to Ambassador Michael Oren after Nofrat Frenkel, an Israeli medical student and observant Conservative Jew, was detained and interrogated by Israeli police in November while wearing a prayer shawl and carrying a Torah during a prayer service held by Women of the Wall, an activist group, in the women's section of the Wall. In January, Anat Hoffman, director of Reform Judaism's Israel Religious Action Center and leader of Women of the Wall, was taken to a Jerusalem police station, where she was interrogated and fingerprinted, and informed that she might be charged with a felony for violating rules of conduct at the Western Wall. The two incidents sparked angry reactions from liberal Jewish movements in America and Israel. In a joint communiqué, leaders of the Conservative movement accused Oren and his government of "permitting ultra-Orthodox extremists to control public life and block other caring and devoted Jews from fully realizing their spiritual quest." Conservative leaders dispute the embassy's characterization of Robinson's Arch as a fair compromise, and argue that the embassy's response was too narrow in its focus. Lissy's organization has urged supporters to complain to the embassy about its letter, and other Conservative groups say they are planning their own responses. Oren has also come under fire for misinforming a December gathering of Conservative leaders about Frenkel's treatment when he assured them that police had simply led her away from the Western Wall. Oren later blamed his government for having given him "incomplete" information about what had happened, and ordered "a full and thorough inquiry" on the matter, which would be forthcoming "within a couple of days." His spokesman said in early January that the inquiry had been completed, but could offer no information on its contents. Reached January 26, a spokesman for Oren declined to comment on the response to the embassy's communiqué or to provide information on the results of the inquiry Oren ordered. In its communiqué, the embassy alluded to a 2003 decision by Israel's Supreme Court that disallowed women from reading from the Torah or wearing prayer shawls at the Western Wall. In its ruling, the embassy noted, the court ordered the state to prepare Robinson's Arch "to host egalitarian services that encourage both men and women to wear tallit and read from the Torah." "The current situation provides all Jews with an outlet for religious expression next to Judaism's most sacred site," the embassy statement asserted. But Conservative leaders noted that the prayer site at the arch is available only until 10:30 each morning, in contrast to the main Western Wall site, which is open for prayer 24 hours a day. Services at the arch must be scheduled beforehand, and anyone arriving or leaving late is charged an $8 entry fee. Unlike the main wall site, Robinson's Arch lacks prayer equipment such as arks, Torah tables, chairs, prayer books and Torahs, which must be brought in by worshippers. It has no indoor facilities. "The letter implied that, 'Hey, look, there's a perfectly good place for people to go and daven at Robinson's Arch…and the answer is, it's not a perfectly good place," said Andrew Sacks, director of the Rabbinical Assembly in Israel, an organization of Masorti rabbis. "It's severely restricted." "The wall as it's been understood by the Jewish people does not mean Robinson's Arch," said Eric Yoffie, president of the Union for Reform Judaism. "It just doesn't." Yoffie did not dispute the embassy's explanation of the legal status of Robinson's Arch, but said that he hoped the arrangement would be revisited. Women of the Wall also disputed the notion of Robinson's Arch as an alternative prayer site for them. In a written response to the embassy's letter, members of the group said, "We do not hold egalitarian services…. Our rights can be realized in the women's section at the Kotel; this is what we have asked and continue to ask…. To deny us this practice at the Kotel is not 'compromise,' as the Embassy response would have it — where is the concession on the part of those who vilify, deny, silence, and banish us?" Some Conservative leaders thought the embassy's letter focused too narrowly on the issue of the Western Wall — or Kotel, as it's known in Hebrew — and did not respond to the larger concerns that the movement's letter-writing campaign had raised. "Our letter did not exclusively address issues of the Kotel, but rather sees the Kotel as one example of… the increasing haredization of Israel, and the increasing alienation of the majority of the world's Jews from not only religious participation, but from any freedom of religious experience in the State of Israel," said Julie Schonfeld, head of the Rabbinical Assembly, the organization of American Conservative rabbis. For some, the original slight of Frenkel's detainment still rankles, and the embassy's response simply didn't go far enough. "I can't get my head around the notion of any Jew being arrested… anywhere in the Jewish state for wearing a tallit," said Rabbi Steven Wernick, executive vice president of the United Synagogue of Conservative Judaism. "Even if one were to accept the government's response here fully, there just have to be better ways to handle this kind of civil disobedience… and none of those issues were addressed by this letter." It was some two months ago that Nofrat Frenkel was arrested at the Western Wall (Kotel) Plaza for the "transgression" of wearing a Tallit. Nofrat, an Israeli born medical student at Ben Gurion University, a member of the Masorti Movement (the Israeli name for the Conservative Movement), is active in Women of the Wall (WOW), a group of Orthodox, Reform and Masorti women who have gathered each Rosh Hodesh (new month) to pray in the women's section of the Kotel. Two weeks ago, the head of the organization, Anat Hoffman, was called in by the police for questioning. She was finger-printed and interrogated. She was then released. The possible charge: inciting a rebellion. These incidents, which reflect an internal problem in Israel – yet another sign of Haredi dominance of the Kotel, touch a raw nerve with North American Jewry. The events were deeply insulting and nearly every American Jewish newspaper reported these events. Even the venerable New York Times devoted significant space to the story. Last week, in San Francisco's Union Square, hundreds of men and women, draped in Tallitot, called on the Israeli authorities to wake up. Yet here in Israel – a near deafening silence. In recent days the leadership of the organizations of the Conservative Movement produced a statement, unprecedented in its scathing nature, aimed at the Israeli government. One must keep in mind that the Conservative Movement is the central stream of Judaism in North America. Its membership fills the ranks of leadership in most all important Jewish organizations. "We feel that the arrest of Nofrat Frankel and the interrogation of Anat Hoffman drives a wedge between our communities at a time when working for unity within Israel and enhancing the connection between Diaspora Jewish communities and Israel should be a primary concern," said the statement. These words come from Jews who hold Israel dear, who have visited Israel time and again, whose support for the State is all but automatic. They feel as though they are being given the cold shoulder by Israel. They are being scorned by the country they so love. They are not valued for who and what they are. American Jews do not live in a cultural vacuum. This is the single most affluent community in Jewish history. They have built public institutions for research, culture, and religion. They carry significant influence in the American public sphere. Yet in recent years there has been a shift. Statistics published by Dr. Steven Cohen, one of America's foremost Jewish sociologists, demonstrate that the strong connection of American Jewry to Israel has been weakening. Now, with the events surrounding the Kotel, American Jewry feels as though they have been spit upon. Have Israelis heard of the biting reaction of American Jewry? Of the public outcry and demonstrations? Of the many letters sent to Israel's ambassador to the United States? Of the numerous essays and opinion articles published in Jewish newspapers? Of the sermons preached in synagogues? The sad answer is that most Israelis are unaware of this response and thus our politicians have been able to avoid the issue. This is a dangerous trend. Not simply because of the Kotel events. The Kotel is but a metaphor for a larger picture. In our haste, our incompetence, and sometimes even our insidiousness, we drive American Jewry even further away from Israel. Only a minority of American Jewry identifies as Orthodox (10%). The majority of affiliated Jews identify with the Conservative and the Reform Movements. Yet when they visit here, in the Jewish State, they encounter systemized discrimination aimed at all who are not Orthodox. Orthodox public institutions receive generous governmental funding, taking advantage of carefully crafted rules and criteria that deny the non-Orthodox the ability to even apply for such allocations. Not forgetting the Orthodox monopoly over marriage, conversion and burial. Occasionally the courts have succeeded in correcting an injustice – but this is but a drop in the ocean. We must not lose one of our most valuable assets - the sense of partnership between Israel and Diaspora Jewry. The bridge must be rebuilt. If we fail to value their Judaism and their contribution – then let us not complain when Israel no longer serves as an inspiration. What is the Jewish Educators' Network? The Jewish Educators' Network is an exciting new initiative for Jewish educators. Wherever you teach - at a Jewish day school or cheder, at informal gatherings or discussion groups - the Jewish Educators' Network will have something for you. The Jewish Educators' Network is open to educators of all denominations and aims to reflect the diversity of Jewish teaching across the community. Take a look through this newsletter, and at our website, to see what the Jewish Educators' Network has to offer. Tu B'Shvat on the Jewish Educators' Network! In time for Tu B'Shvat, the Jewish Educators' Network is proud to announce the launch of its on-line resource centre. The Jewish Educators' Network has a core team of professional educators, led by Matt Plen and Rina Wolfson. The educators contributing to the Jewish Educators' Network reflect the diversity of Jewish teaching across the community. This ensures that the network remains open and welcoming to teachers across the spectrum of Jewish life. 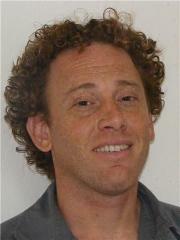 Matt Plen is the Movement Director of the Assembly of Masorti Synagogues. Living in Israel from 1998-2008, he taught and developed educational resources at the Masorti high school, the Conservative Yeshiva and Melitz (Centres for Jewish Zionist Education). He has trained teachers in the areas of Jewish studies, values and identity, and family education. Matt has an MA in Judaic Studies from the Jewish Theological Seminary and is pursuing a doctorate in Jewish Education at the Hebrew University of Jerusalem. Rina Wolfson has an M.Phil in Hebrew and Aramaic from Cambridge University. She is a graduate of Midreshet Lindenbaum, Jerusalem, and is currently studying at the Masorti Kollel. Rina is Education Coordinator of Lishma Jewish Study Centres and heads the Jewish Studies GCSE programme at Gesher, the Masorti teenage centre. She is Director of PAJE: Passionate About Jewish Education, where she teaches children and adults of all ages. If you know of someone who might be interested in joining the network, or who might enjoy the services we offer, please feel free to forward this email on to them. Ynetnews.com: "Free the Kotel a 2nd time"
AMBA Kosher Restaurant open in Montclair! 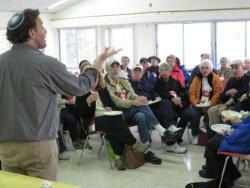 Rabbi Joshua Cahan: "The Centrality of Outreach"